Students love the thrill of Laser Skirmish Games. 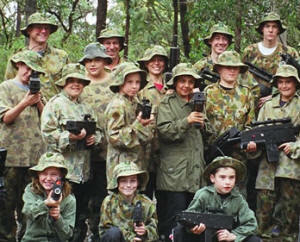 Laser Skirmish is a perfect choice for midweek school excursions and field trips or summer camps. Whether you are from a High School, Middle School or other school group, Laser Skirmish is a fantastic idea for an outdoor activity-based learning experience. All activities are run by professional Laser Skirmish referees. All you need to do is join in on the fun. If you have single class of 20 students, or the whole school - we can cater for you! In fact, large groups are our specialty, we can have 300 players at once! Book in a school group and we will handle everything [call us to find out more PH 1300 666 559]. If you are the teacher of a school students nowadays you know it can be challenging to really engage schoolies in what you are studying. With Laser Skirmish we offer you an active learning environment. As the end of the school term approaches, teachers are looking for something to get students excited and involved. Many students nowadays have tried archery, canoeing, horse-riding, and ropes courses and are looking for something different. With many entertainment options such as DVDs and computer games, kids have sophisticated expectations. They seek something to challenge them. Focus the class on new school incentives or leadership goals, e.g. for a new Senior Year. Develop an "esprit de corps" a common spirit of comradeship, enthusiasm, and devotion to a cause among the members of the school. Unite disparate class, promote teamwork between boys and girls, teachers & students. Challenge your class to work together effectively and creatively. Including a laser skirmish activity in school excursion or school camp activities makes sense. Exciting and innovative team activities are tailored for your groups' needs to powerfully illustrate the importance of strong teams, and a strong culture. The mixture of action and learning is developed to suit your team, your school class, and your needs.